(RT) In face of State Department and Pentagon opposition, the Senate voted 63-37 to allow a floor vote on Resolution 54, a bipartisan proposal to block any further US support to the Saudi-led coalition waging war in Yemen since 2015. 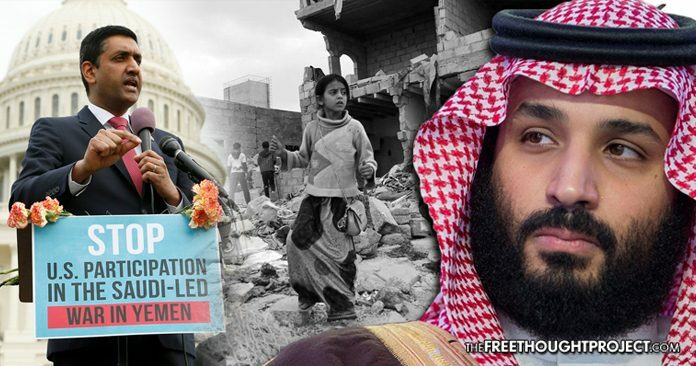 If actually adopted by the Senate with a veto-proof majority, the resolution would force the Trump administration to stop logistical and other support to the Saudi coalition, and require authorization from Congress before such support is given. Proposed by Senator Bernie Sanders (I-Vermont), the resolution has found backers in many Senate Democrats, as well as Senators Mike Lee (R-Utah) and Rand Paul (R-Kentucky). Judging by the vote on Wednesday, several more Republicans are in favor of at least having a floor vote on the issue. Earlier in the day, the Senate was briefed in a closed session by Secretary of State Mike Pompeo and Secretary of Defense James Mattis, both of whom argued that the resolution would weaken Washington’s leverage with Riyadh and urged the legislators to back down. “I know all too well the difficulty in reconciling human aspirations with war’s grim reality; but I also recognize that we cannot limit civilian casualties or advance the peace effort commencing early next month in Sweden by disengaging,”Mattis said in prepared marks provided to select media outlets. Pulling back our limited US military support, our weapons sales to our partners, and our protection of the Saudi and Emirati populations would be misguided on the eve of the promising initial negotiations,” he added. “I know the conflict in Yemen is ugly. We are engaged in diplomacy all around the world to make it less so — and have actually made it less ugly. But it’s important to remain involved” he told the Senate, according to prepared remarks. Saudi Arabia began bombing Yemen in March 2015, which was followed by a ground invasion, in the name of restoring the pro-Riyadh regime of President Abdrabbuh Mansur Hadi who was overthrown by Houthi rebels in September 2014. The Saudi coalition has since included forces from the United Arab Emirates, Bahrain, Kuwait, Egypt, Jordan, Morocco and Sudan, as well as Qatar before it withdrew in 2017. Riyadh argues that Houthis are a proxy of Iran, which Tehran has denied. The war has claimed over 10,000 lives so far, and millions of Yemenis have been affected by famine and disease as a result of the Saudi-led blockade and bombardment. The US, UK and several other countries are providing logistical and intelligence support to the Saudi coalition, though there is a limited number of US troops on the ground in Yemen under the banner of fighting the Al-Qaeda terrorist presence there. There was never a congressional authorization for involvement in the country; the Bush, Obama and now Trump administrations have invoked the 2001 authorization to use military force against Al-Qaeda.